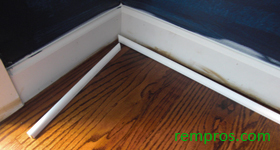 After installation of a baseboard you might need or want to install shoe base molding. In some cases it is unavoidable because of a gap in between the baseboard and actual floor and to cover that gap you have to install shoe base. If you have a carpet it is not necessary to install shoe base, but if it is a part of a design it is definitely possible. Shoe base is easy to install and very similar to baseboard installation. First of all, measure the length of a shoe base which will be installed, and cut pieces using a miter saw. The same as with a baseboard, cut inside and outside corners at 45°. Always start installation from the longest wall. If the wall is longer than longest piece of a shoe base you have to connect pieces at 45° to make connection less visible. After that nail shoe base pieces to the baseboard and to the floor if it is nailed or glued down type of a hardwood floor installation. Do not nail shoe base molding to any type of floating floor whether it is an engineered click and lock, laminate or floating cork floor. In the places where shoe molding meets with a door casing finish shoe base side with two cuts: first at 90° by the size and then slightly “trim” the corner at 30°. With a shoe base you don’t need to find studs – just nail it to the baseboard. If you have a bifold doors make sure to “trim” the sides of a shoe base to let the doors open properly. Ones it’s installed – patch the holes left after finish nail gun and caulk in between shoe base molding and baseboard. Watch our video how to install shoe base molding for better understanding. Should I paint shoe base before or after installation? It is always better to paint shoe base molding before installation. After it is installer just fix the wholes after nail gun and touch up paint. The same if you are planning to stain the shoe base – it is better to do before installation. Buy a right size of shoe base molding. If it is possible try to buy shoe base in the length which cover the wall in one piece. If it is impossible – make connections in the most invisible spots. Also if you will replace just a shoe base but old baseboard will stay – make sure the height of new shoe will match or be higher than old one. Otherwise you spend more time finishing baseboard. How long does it take to install new shoe base molding? For the medium size bedroom with a closed it shouldn’t take longer than couple of hours, but for professional installer about 30 min. How much does it cost to install shoe base molding? 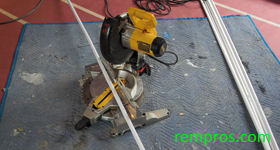 If you will hire installer to put a baseboard in one room prepare to pay minimum rate. If it is a whole house or a major renovation project the price will be around $0.5 - $1 s/f for labor.